When I saw these new releases from Kane Miller, I thought they were worth looking into and I was glad to have done so. This book isn't all about using The Pleasant Word merely as a tool to receive something in exchange for the word's usage. Rather, it is to promote polite behavior and conversation. I rather like it as a result. 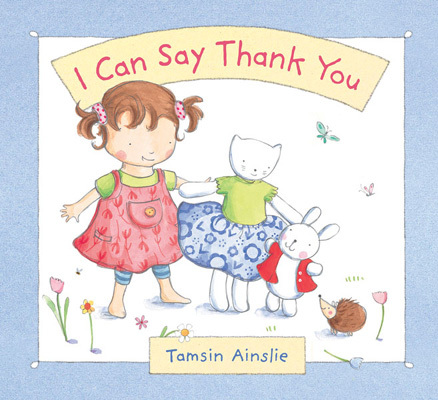 I Can Say Thank You, also Ainslie is a very short, brief introduction to the idea of making a grateful declaration of thanks when it is due. It pictures the same little girl in adorable pigtails learning to say thank you to others for things like playing with her, giving and receiving compliments, receiving gifts, and sharing. Each page spread offers encouragement to say this little phrase for very basic acts of kindness. There is only one sentence per page, followed by the coveted phrase. 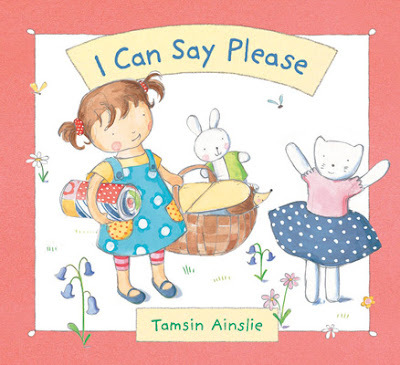 This particular book is much more straight forward in teaching the child to offer thanks for a variety of things and, as such, is a very useful tool. I have been positively amazed of late at how few young children speak, not only to other children but to adults in an unkind, ungracious and disrespectful manner. Perhaps I am more acutely aware of society's lack of good manners now that I'm trying to teach them to my own children. At any rate, books like these are welcomed in our household and I would like to think that they would be hastily and enthusiastically utilized by other parents as well. Society could stand some good manners. Not just for manner's sake but because we ought to be treating others as we would like to be treated and so it's a no brainer that we should practice learning to speak to other people in a respectful manner. I'm very grateful to Kane Miller for shooting copies of these two titles my way. I plan to make plenty good use of them, particularly in the months ahead as we drill our pleases and thank yous into little minds and hearts. And perhaps into the big minds and hearts as well! Have you seen the "What Do You Say, Dear" and "What Do You Do, Dear" books? Those are just adorable. Yes! We have those as well and I really like them also.